This post is a continuation of the several immediately preceding ones about schoolchildren interpreters. What do the YI pupils think themselves about what they’re doing? Here are a few opinions from the William Howard school in Cumbria, in the north west of England (12 languages spoken). On this page of the EMTAS website there’s a video of an interview with a professional interpreter as an encouragement to pupils to consider interpreting as a career. I asked Astrid about this, and she replied as follows. 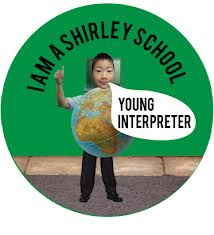 Do you know a school that could benefit from a Young Interpreter scheme? If so, get in touch with Astrid Gouwy at Astrid.Gouwy@hants.gov.uk. Hampshire EMTAS. Young Interpreter Newsletter 8, March 2013. Accessible here. The key page of the Young Interpreter Scheme is here. There’s a link to a PowerPoint explanation. Shirley School is a primary school in Cambridge, UK. Motto: "Determined to succeed." This is a continuation of the previous posts Young Interpreters (1) and (2), which should be read first. Through Pat Richards, I was put in touch with Astrid Gouwy, who is in charge of the whole Young Interpreter (YI) movement. I call it a movement – they themselves call it a scheme – because although it was started by and still functions primarily for one UK education agency, the Hampshire County Council Ethnic Minority and Traveller Achievement Service (EMTAS) – traveller in this context refers to Roma gypsies, itinerant fairground workers and the like – its influence has already spread beyond. It's recognised by local education authorities across the UK for its innovative approach and it has reached Canada, the USA and Amman, Jordan. In 2010 it won a European Award for Languages. It even holds an annual conference. A recent EMTAS survey counted 169 YI interpreters speaking 36 different languages, and added, "However, we know that there are many more Young Interpreters out there." That's why I employed the cliché tip of the iceberg when referring to the five at The Emmbrook School in the previous post. Among all the above activities, there are some that can be classed as language brokering and others as incipient liaison interpreting. I put three crucial questions to Astrid, which she was kind enough to answer. So I'll quote her in extenso. 1. Q: What are the admission criteria. Is there a an aptitude test? A language test? A translation test? A: "There is no test to take part in the scheme. Pupils can be nominated by staff or volunteer themselves. Pupils may have been new arrivals themselves, have a particular interest in languages or wish to help others. Pupils taking part should be good role models in terms of behaviour but also in terms of their use English. They should be patient, kind, caring, responsible, good listeners and good communicators. Young Interpreters can be bilingual/multilingual but participation from monolingual indigenous pupils is also encouraged, especially when they are interested in other languages or are in fact gifted and talented in languages. This really helps in raising awareness of how pupils with EAL may feel in their new school. It is not essential to be perfectly bilingual because the role involves the element of providing a welcoming environment by being an empathetic friend and through their training, pupils learn to cope in situations where there is no shared language. This means that Young Interpreters can use a variety of strategies to support new arrivals - from use of L1 to use of visuals etc." 2. Q: Assuming there is some training, what form does it take and who gives it? A: "This leads us to the training part of the scheme. Schools deliver the training themselves using the guidance, lesson plans and materials from the pack. They are pretty self-explanatory, especially with the recent addition of Moodle (a virtual learning platform) so most schools just go ahead and do it. Others get in touch with me when they require more guidance. The training consists of 4 sessions and there is a different scheme for infants, juniors and secondary students. They all have in common an empathy exercise where trainees are spoken to in an unknown language to help them start develop empathy towards new arrivals and to help unpick what helps communication. Finally, a range of role play scenarios allow all pupils to show an ability to help a new arrival - whether in first language or using some of the strategies from the empathy exercise." 3. Q: There's reference in the newspaper report to the new Emmbrook YIs having "qualified". On what basis? Is there a test for it? A: "There is no test or assessment at the end of the training. Students receive their badge and certificate once they have completed their four training sessions. The students you read about online qualified following their training with their key member of staff. We have developed an accredited course for adults however which we have successfully run on request with college students at level 2 and 3." The training given, even if it's rudimentary, means that YI graduates are no longer naive Natural Translators. Source: Mothertongue multi-ethnic counselling and listening services. ﻿ Back in 1995, a Canadian schoolteacher and I co-authored a paper about an organization of bilingual pupils who had formed, under teacher supervision, a corps of interpreters to serve their fellow pupils and the staff in an Ottawa school (see References). They called themsleves The Ambassadors. Since then, there were reports on this blog of students acting as interpreters in their schools (for an example, enter bayley in the Search box on the right), but I hadn't seen any about an organized corps. Until recently, when the following report from England caught my attention. It came from a school at Wokingham. Wokingham, in case you don't know it, is an affluent town just west of London. Last year, The Telegraph newspaper rated it "the best place in England and Wales to bring up a family." 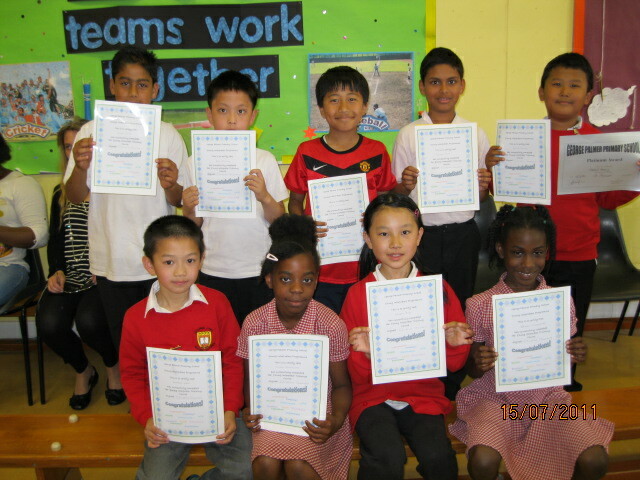 "Help is at hand for Mandarin, Punjabi and Thai speakers at The Emmbrook School from newly-qualified young interpreters. "In a borough first, nine bilingual pupils at the Emmbrook Road school have qualified in a Hampshire County Council scheme that will help new arrivals settle in and help arrange international visits from prospective parents and pupils. 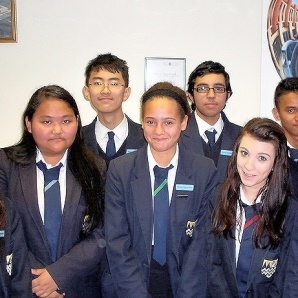 "Jana Crichlow, Ioana Gurau, Knight Anumat, Daljinder Hansra, Anna Xue, Benjamin Elison, Haiyang Huang, Nuyam Limbu and Sharvaree Puranik are all excited to have taken on the roles. "The talented teenagers are skilled in a range of languages from across the continents, including Romanian, Icelandic, Hindi and Nepali." "The Emmbrook School is a co-educational comprehensive school for students between 11 and 18 years of age. There are around 1,378 students at the school, with nearly 200 in the Sixth [the highest] Form." "Young Interpreters are a new venture for us. We are currently training a small group of sixth formers." and she put me in touch with the Hampshire County Council scheme mentioned in the report. It was at that point that I realised I'd only been looking at the tip of the iceberg. Jon Nurse. Bi-lingual Emmbrook pupils qualify as interpreters. Getbracknell, 25 January 2013. The report is here. James Hall. Wokingham is best place for young family. The Telegraph, 1 October 2012. The article is here. Carolyn Bullock and Brian Harris. Schoolchildren as community interpreters. In S. E. Carr et al. (eds. ), The Critical Link: Interpreters in the Community. Papers from the 1st International Conference on Interpreting in Legal, Health and Social Settings, Geneva Park, Canada, 1-4 June 1995, Amsterdam, Benjamins, 1997, pp. 227-235. The Emmbrook School website is here. In the last post, a teacher was quoted as saying, "'Bilingualism isn't a learning difficulty." "Lack of English should not be equated with lack of knowledge, skill or understanding. Bilingual learners are no more likely to have special educational needs (SEN) than any other pupil. "Bilingual learners acquire social, conversational English quickly, so it is important that teachers are not misled by pupils' surface fluency. Some pupils, however, take a long time before they feel confident enough to participate actively in classroom activities and use the English they have learned. A 'silent period' is natural and should not be construed as the child having learning difficulties. Lack of progress may be due to the abstract nature of tasks rather than underlying learning difficulties." new arrivals may be going through the 'silent period' whilst they are becoming accustomed to the language and to a new school. they may be adjusting to a more informal system of education, having come from an educational system which relied heavily upon rote learning. they may be slower at understanding lessons and tasks because they are having to translate everything into their first language. They may not have enough time to record the homework which has been set or to complete tasks. they may feel insecure without the support of their friends. the subject contents may be very different, especially in History and English. Some subjects may be completely new. Ethnic Minority and Traveller Achievement Service (EMTAS). Special Education Needs (SEN). Hantsweb, 2011. Click here. This is the first of two or more posts about adolescent interpreters in schools in England. In order to appreciate who they are and what they're doing, we have to know something about the language situation in the schools as it is these days. In my twelve years in primary and secondary schools in London many decades ago (yes, I'm old) I only got to know three early bilinguals. Two of them were from Gibraltar, fluently bilingual in English and Spanish; they'd been evacuated temporarily to England along with all the rest of the civilian population of Gibraltar. (For more about this, enter gibraltar in the Search box on the right.) The third was a son of a Greek Cypriot family that had emigrated. That proportion was normal. It wouldn't be today. Immigration has made of the UK a country of bilinguals. Don't be misled by the many adamant monolinguals who don't want to learn another language or think they can't. Nor by the fallen enrolments for university language degrees; bilinguals don't necessarily go for a degree in their non-English language. Indeed many of the UK bilinguals know languages for which degrees aren't offered. Just look in the schools. To drive the point home, here's an extreme but revealing case. "Not one pupil at the Peterborough school speaks English as a first language. But, despite the challenges, it has just received a glowing Ofsted report." "The colourful displays, the smell of crayons, and the hush of mid-morning lessons feels the same as any primary school in Britain, and the children huddled around tables ... speak perfect English and there are a number of white faces because of the recent arrival of Latvian, Lithuanian and Polish children from families drawn to agricultural jobs in the area.... The town... became a major centre for Italian immigrants in the 1950s, who laboured in the brickworks and later, Pakistani and Bangladeshi workers. There are more than 100 languages spoken and more than a third of children in Peterborough speak English as their second language, up from one in five in 2008. 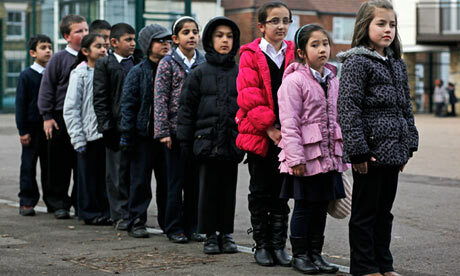 "Across Britain, schools are becoming more multicultural. Just over one million primary and secondary pupils spoke a first language other than English in 2012 compared with around 800,000 in 2007. On average, one in six (17.5%) primary school pupils in 2012 spoke another language at home, up from 16.8% in 2011. The challenges facing Gladstone primary, though, seem particularly acute. About 80% of its pupils are from a Pakistani background: most speak Punjabi but the school's 20 other languages include Dari, Pashto, Gujarati, Kurdish, Arabic, Lithuanian, Latvian, Russian, Polish, Slovakian, Czech, German and French. One child is from the Seychelles; another from Guinea Bissau. At break, six Year 5 girls all cheerily admit they couldn't speak English when they arrived at school..
"Where does a school begin when faced with so many foreign languages? 'Bilingualism isn't a learning difficulty. A positive view of the bilingual child is the key,' says Parker [headteacher Christine Parker] firmly. She was born in Orpington, Kent and, her view of teaching was transformed in 1986 when she began teaching at a school in Sheffield where a third of pupils were of Pakistani descent. Inspired, she worked in Pakistan in the late 80s, picked up Urdu, and has taught in diverse schools ever since. "Those who fear that parts of Britain are becoming ghettos wonder whether the children of non-British parents are sufficiently encouraged to learn English. When I ask if Parker has ever encountered a child who doesn't want to learn the language, Parker looks at me as if I am talking gobbledegook. 'No,' she says, amazed that anyone would consider this to be a possibility. And does Gladstone ever forbid foreign languages be spoken at school? 'Why would you do that?' she asks, mystified. "The school is helped by additional local-authority funding for newly arrived pupils in their first three years at school. [This] has funded innovations such as a new 'family support worker' who liaises with parents (who may struggle with English). Other unique features include a buddy system, so new arrivals are paired up with schoolmates who speak their 'specialist' language, and Gladstone's determination to forge links with other schools. "What's the best thing about the school? 'We're famous!' cries Sarah, eight. 'We've been on TV. We've been on the newspapers. We've been everywhere.'" 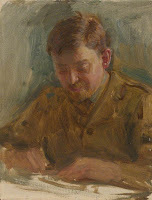 Patrick Barkham. The school where they speak 20 languages: a day at Gladstone Primary. Guardian Unlimited, 28 February 2013. The article is here. My emphasis. Children from Afghanistan, Pakistan, Portugal, Lithuania and Slovakia in the playground at Gladstone Primary. Photograph: David Sillitoe for The Guardian.